Two world wars have gone by since the frail, old man first grabbed his father’s accordion without permission, yet his fingers still dance over its buttons. Eight decades have plowed wrinkles on his dark skin, yet his arms still squeeze feeling and cadence out of the bellows. Sitting on the porch of his son’s house, Francisco “Old Man Pacho” Rada told me of those days of his youth when, in the tradition of the mythical Francisco el Hombre (of One Hundred Years of Solitude fame), he rode a donkey from town to town, telling stories in song and answering insults with witty verses. As a juglar (minstrel), he articulated the emotions and experiences of the people in the Caribbean region of Colombia. Those were days when a minstrel would sing about falling in love with a widow from the town of Oreganal, only to have the presumed dead husband come back to claim his place. Back then, songs were spun from anecdotes, like the one about the priests who stole the golden chalice from the town of Badillo. It was a time when a song would emerge out of the tale of a cursed town where only an accordion saved a minstrel’s chest from three murderous knives. This was an era when Rada’s donkey was not as fast as his songs. In those days, his accordion-laden verses forded rivers and climbed snow-capped mountains, escorted by the sounds of a drum and a wooden scraper to be sung at parrandas (jam sessions) in every corner of this magical region where “Pacho” Rada was often known by name but not by face. “By word of mouth, that’s how stories and songs would arrive,” said Rada, who has been playing accordion 88 of his 92 years. This musical genre, vallenato, is today entrusted to CDs and computer files instead of people’s memories. Accordionists now hop on 747s instead of donkeys to play all over the Spanish-speaking world. This progress has also allowed commercialism to get a hold of this centuries-old genre, and to threaten its existence. But thanks to a folk music festival held in Valledupar for the last 32 years, the legacy of Rada and other minstrels has withstood the battering of commercially driven mutations. After decades of road dust and evenings full of notes, Rada came to Valledupar last year with four other legendary minstrels to receive the title of “lifelong kings” for their contribution to vallenato. Their crowning was the highlight of the Festival de la Leyenda Vallenata. Since 1967, accordion players from Colombia’s Caribbean region have been coming to this city to compete for the title of Rey Vallenato, king of vallenato. Their performances pack the city’s colonial plaza with thousands of people who, in the tropical heat, douse each other with water bottles and embrace the notes of son, paseo, merengue and puya, the four rhythms that make up vallenato. 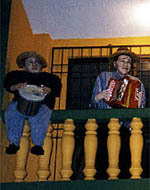 The first time the outside world heard of this musical tradition was in the pages of One Hundred Years of Solitude, by Gabriel Garcia Marquez, a novel he once referred to as “nothing more than a 400-page vallenato song.” Francisco el Hombre, one of the central figures in vallenato folklore, makes several haunting appearances, and the marathonparrandas of Aureliano Segundo Buendia are a recurring theme. Today, vallenato, the music that Rada and Buendia inherited from their forefathers and mysterious minstrels, does not travel by word of mouth but through the radio. Six years ago, these notes exploded out of Colombia and into the Latin musical world when former Colombian soap opera star Carlos Vives recorded Clasicos de la Provincia, a vallenato album with some modern additions. Clubs from Madrid to Mexico City began playing the music, and stars like Gloria Estefan and Julio Iglesias began including vallenato-flavored melodies in their repertoires. But in the race to make a quick buck, many groups are playing other musical forms like the ballad and takes on Mexican ranchera and selling it as vallenato. Folklorists and music purists fear this new genre will send the real vallenato into oblivion, killing a tradition that goes back some 300 years. Rada and Rafael Escalona, vallenato’s best-known composer and one of Garcia Marquez’s dear friends, believe this has destroyed the quality of the music and desecrated the essence of this region’s people. “Some of the young guys today are trying to knock down our folklore. That music they are playing is not ours, is not from here,” Rada said. However, there is hope for true vallenato, Escalona told me a few days later at a luncheon in honor of Rada at the [social] Club Valledupar. He pointed out that the old vallenato songs, because of their honesty, are eternal, while today’s synthetic hits burn out quickly. They live in this agricultural city where people talk about good and evil spirits with the same matter-of-fact attitude they use when talking about the bad recession. In Valledupar, raw and honest vallenato still smells like the mango tree that shades a midday parranda and the caja drum still thumps like the hooves in a morning cattle roundup. In the last week of April, the performers begin arriving for the festival in this city of colonial houses. They come to clash in battles of improvised verses, or to show off their skills playing the caja or the wooden scraper called guacharaca. But those are just sideshows. The contest that even Colombian presidents come to witness is the struggle between accordion players for the honor of being named King of Vallenato. The pretenders come from all over, from towns in the arid deserts of La Guajira state to the north, and from the settlements around the steamy marshes of La Cienaga Grande to the west. And even a few cachacos come from the cold lands around Bogota, up in the Andes, where vallenato has become popular only in the last two decades. For five days at the end of April, accordion players climb atop the Francisco el Hombre Stage to show off their skills and be judged by the crowds and the silent Spanish-era homes that ring the plaza where the stage sits. 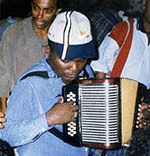 On that night, the four remaining accordionists stand next to each other with their respective drum and guacharaca players to go through each of the four rhythms. Boos and cheers are common, and it all comes to a boiling point when they have to play the puya, the fastest by far of all the rhythms. The speed at which the musicians play can make any mistake obvious to the sea of people that stretches from the white House of the Porticos at the south end of the plaza to the edges of the 4-foot-high stage. Many folklorists and purists say that if it were not for this festival, this national treasure would have already been mauled beyond recognition by record companies and commercial radio stations. Starting in front of his tree-shaded porch, folklorist and historian Tomás Dario Gutierrez Hinojosa tells me how rhythms like puya and son are not recorded anymore, and only a handful of groups record merengue and paseo without morphing them into some other music form. “Whatever exists today of authentic vallenato, we owe it to the festival,” Gutierrez Hinojosa said. Despite the commercialism that has invaded the folklore and that produces little real vallenato, I can still hear this music at any of the get-togethers that materialize spontaneously on any afternoon with the excuse of enjoying the breeze from the Sierra Nevada de Santa Marta mountains. Any day of the year the sound of the revered accordion can be heard in almost every block. It is common to walk through the open doors of a home to find friends and relatives singing to the fluid notes of an accordion while the thump of a caja and the hiss of a guacharaca dress up the song. This, as a tall pot of rich goat soup boils in the kitchen. That is a normal week. During festival week, it is impossible to find an accordion player with time to come to a parranda at your home. Still, all you have to do to be in one is go to the Plaza Alfonso Lopez, Valledupar’s town square. After his heat on the Friday before last year’s final, Horacio Escorcia came down from the Francisco el Hombre Stage with a disappointed look on his face. He headed to a small cafeteria at the northern edge of the plaza where José Atuesta, one of his friends, was treating my cousins and me to sweaty cans of Aguila beer to ward off the heat. Rada, the “lifelong king,” told me earlier that the first time he played an accordion was during one of those get-togethers in the town of Plato on the Magadalena River. As the party was just getting started, the 4-year-old grabbed his father’s accordion and, without hesitation, began playing the notes of a song called La Chencha. Rada went on to become a well-known composer and accordion player, but it wasn’t always a romantic life. Only in the last 25 years or so has the Colombia beyond the Caribbean region come to appreciate and honor vallenato. And it was not until Carlos Vives hit the stage, with his long hair and his chiseled face, that vallenato made it to the Latin mainstream. Gutierrez Hinojosa, the folklorist, said that prior to the festival, this multi-racial music was considered entertainment for cowhands and the uncivilized people who lived in the outback. If any blueblood enjoyed it, it was out by rivers, or with his workers by the cow pens, where no one of any social standing would hear him or see him. But today, people like Rada and Escalona are honored in its dining rooms. Gutierrez Hinojosa dates the origin of vallenato to the moment when the Indian, African and European races clashed, and eventually fused, along the banks of the Cesar and Guatapuri rivers and in the Guajiro dessert. Following the arrival of the first Spaniards at the dawn of the 16th century, runaway slaves from the port cities of Santa Marta and Riohacha took refuge among the tribes that inhabited this valley, often mixing into the Indian population. When the Spaniards decided to settle the region in earnest a couple of generations later, the roots of vallenato were already sinking deep into the fertile lands of wild cattle and towering ceiba trees. With the Spaniards, another important element joined the emerging folklore: the Spanish language. Today, many vallenato songs still have the 10-stanza decima that was popular among Spaniard poets during Spain’s Golden Age under Phillip II. The contributions each of the three races made are symbolized today in vallenato’s three traditional instruments: the European accordion, the African caja drum and the Indian guacharaca. By the late 1600s, puya, merengue and son already existed. (The paseo rhythm emerged earlier this century.) They were played with two Indian flutes, one with high pitches, one with low. Then in the last decades of the 19th century, European sailors began introducing the accordion through the port cities. Gutierrez Hinojosa said that when the accordion was brought to this musical form, it fit perfectly because it was capable of playing the role of both flutes. Nobody is sure whether the accordion traveled down rivers from the port cities to reach the inland towns of the Caribbean area, or on the backs of the mule caravans that once crisscrossed the region. But one thing is certain: Centuries after Indians and Africans had their first parranda, vallenato became the language of these people, and men like Rada and Escalona their spokesmen. Nicolas “Colacho” Mendoza, regarded as one of the greatest accordion players ever, remembered a time when Escalona voiced the indignation of the people of Badillo after their church’s colonial-era chalice was switched for one of lower quality and no historical value. Mendoza said the evidence pointed at a priest who lived in nearby Valledupar. Escalona immediately wrote a song, called La Custodia de Badillo (The chalice of Badillo) that detailed the rumors in the dusty streets and accused the local authorities of not doing anything for fear of the church. And a generation before that, a witty 4-year-old unknowingly had also taken on his shoulders the responsibility of chronicling the history and heritage of his people. Eight decades later, Rada looked toward his son, Beto, and his grandson, Cheche, and confidently said that this legacy will go on. A few moments later, he picked up an accordion patched up with duct tape and in song compared Beto and Cheche to undefeated roosters in a cockfight. Sun-Sentinel.com Copyright 1999, Sun-Sentinel Co. & South Florida Interactive, Inc.